If someone forces you to stay in wet clothes for a long time, you know how uncomfortable it feels. Now, imagine the condition of the babies who have to wear the diapers for long hours. Little babies cannot voice out their discomfort other than crying because they do feel the uneasiness. And, the most common result to that is the occurrence of the diaper rashes. The term diaper rash is used to describe the irritation in the diaper-clad portions of your baby’s skin. Although, I thoroughly understand the problem of the parents who have to take the help of the diapers to reduce their cleaning workload, but it is better to use it less especially when you are at home with your baby. Nevertheless, this is a common problem. But you can use natural home remedies to treat diaper rashes in babies and that’ll effectively ease the irritation in your babies. Well, in case you are confused, let me tell you that there are natural ingredients using which you can treat the diaper rashes. And today, I will be sharing with you the top 22 simple and most effective home remedies to treat diaper rashes in babies. If you have a baby at home, and you are worried about his/her diaper rashes, then keep reading the post to know about these simple yet effective remedies to treat diaper rashes naturally and easily. Little babies are the greatest gift of God to you. Their one innocent smile is enough to remove all the sadness from your life. So, as a guardian it is your duty to protect your baby when he/she is small and unable to take care of oneself. Be it from serious health problems or common issues like diaper rash, a parent’s constant care for the little one is essential. Most parents prefer visiting the doctor’s chambers in such cases, which is absolutely Ok. 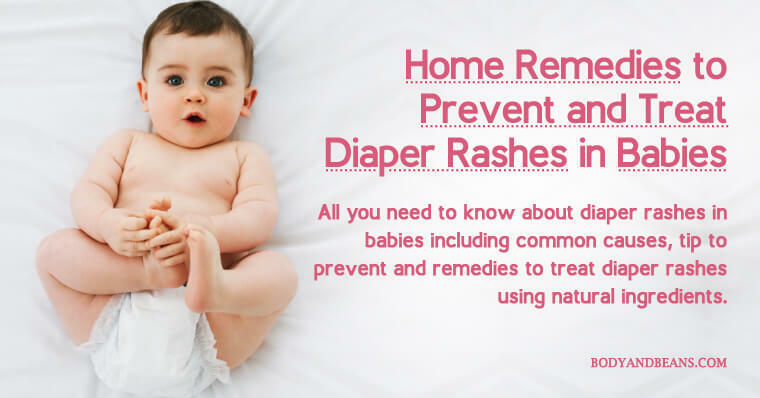 But if you want to go the natural way and treat your baby with natural ingredients instead of medicines, then this list of most effective home remedies to treat diaper rashes in babies, will definitely be of great help to you. I will be sharing you all the simple and effective home remedies to treat diaper rashes in babies in detail, but before that, let us understand about the basic causes, types and the symptoms of diaper rashes in little ones. If you have become a parent for the first time, then knowing these small little things are essential for you. When wet or used diapers are in contact with the skin of your body for a long time, then it may cause the diaper rashes. Bacteria and fungi may cause skin infections in little ones which may lead to diaper rashes. Too much sensitivity to the diaperssometimes results in diaper rashes. In case of any allergic reactions (mainly food allergies) also, your baby may experience diaper rashes (although it is quite rare). Digestive problems in babies may also lead to it. Now, that you know all the basic details regarding diaper rash, let us begin with the simple and effective home remedies to treat diaper rashes in babies. Babies need special care and when they develop diaper rashes, it is always safe to use the natural remedies for the treatment of rashes. These methods are very easy to use and all of them are very much safe to be used on a baby skin. You just have to know the right technique to apply them to get fast results. So, here are the various natural home remedies to treat diaper rashes in babies. One of the safest natural home remedies to treat diaper rashes in babies is by using coconut oil. This is my personal favourite remedy and I think that it gives huge benefits. The presence of the saturated fats in coconut oil keep the skin of your baby soft and supple while it being an antimicrobial agent treats the diaper rashes in no time. It soothes the inflammation and moisturizes the infected area. Method of application: Firstly, wash your baby’s bottom with lukewarm water and then pat it dry. After that, take around half tablespoon of pure natural coconut oil and massage it gently on the affected portions of your baby’s skin. Continue doing this twice on a daily basis for significant improvements. The next best option to get rid of the diaper rashes in babies is by using baking soda or sodium bicarbonate. This is basic in nature which helps to neutralize the acids and also balance the pH level of the baby’s skin. Also, reports showed baking sodaas a great antibacterial and antifungal agent that can easily kill the microbes and soothe the skin irritation and infections. So, you can definitely use it on the diaper rashes of your baby. Method of application: Take around 2 tablespoon of baking soda and 4 cups of lukewarm water. Mix the two ingredients well. Now, wash the infected skin of your baby with this solution. Keep it naturally dry. Use this remedy on a daily basis for quick benefits. Over the years studies have shown oatmeal to be a great anti-inflammatory agent that is very effective against dry irritated skin and hence it is widely used in dermatology. Oatmeal is also rich in protein that helps in preservation of the natural barrier of your baby’s sensitive skin. Also, the compounds like saponins present in oatmeal are very beneficial in removing the dirt and oil from the skin that further prevents the occurrence of the rashes. Method of application: Mix around 1 tablespoon of oatmeal to the bath water of your baby. Make your baby sit in that water for around 15 minutes and then pick him/her up and pat dry. This remedy if done every day will soothe the irritated skin very fast. You can definitely use Epsom salt to treat diaper rash in your baby as it contains magnesium in high amounts which makes it a great anti-inflammatory agent. Several studies are a proof of that and Epsom salt bath has been widely recommended in healing the dry irritated and inflamed skin. Method of application: Take a tub of water and add around half a cup of Epsom salt in it. Soak your baby in the water for around 15 minutes and then pat the skin dry. Repeat the process twice or thrice weekly for good benefits. Aloe vera has already earned its name as a great natural remedy for beauty problems and it is also one of the greatest home remedies to treat diaper rashes in babies as well. Aloe vera is a great healing agent that is very efficient in soothing the inflamed skin no matter how sensitive it is. Moreover, it is also antimicrobial in nature that combats the diaper causing bacteria and fungus. Method of application: Take some aloe vera gel in your fingertips and gently apply it on the infected skin of your baby. Do this everyday two times to get rid of the diaper rash fast. Nothing can be as pure and useful to a baby than the mother’s milk. It has the power to strengthen the immune system of the baby and protect him/her from various diseases and infections. Well, you can definitely use it as one of the home remedies to treat diaper rashes in babies. In fact, studies have shown it to be an antibacterial agent that will fight the microbes and treat the infections fast. Method of application: The process is very simple. Just apply few drops of breast milk on the infected skin of your baby and let it dry naturally. You can do this whenever you feel like to prevent and treat diaper rashes in babies. We all know that plain yogurt is probiotic in nature and that is greatly beneficial against various kinds of microbial skin infections. It also has anti-inflammatory properties that helps soothe the inflamed skin very fast. In fact, eating probiotic yogurt is proved to be very good in treating candida infected skin. Method of application: If your baby is grown enough to eat solids, then you can definitely feed him/her with the plain probiotic yogurt. Alternatively, you may apply the yogurt on the infected skin of your baby and clean it after keeping for some time. Do this on a daily or frequent basis for effective results. Several researches on apple cider vinegar has shown that it has a lot of therapeutic potential and it can be used in treating infections. It is a great disinfectant that has the potential to kill the diaper rash causing microbes very fast. So, you can use the antimicrobial vinegar in treating the diaper rashes of your baby. However, please do not use it raw as it is slightly acidic in nature owing to the presence of acetic acid which is otherwise very useful. Method of application: Take a cup of warm water and add a teaspoon of apple cider vinegar to it. Then take a soothing piece of cloth and dip it into the solution. After that, wipe your baby’s infected skin with it. Use this remedy daily for the significant improvements. One of the major factors behind the occurrence of the diaper rashes is the constant exposure of the skin to urine. Urine has a high alkaline content that can easily cause irritation in the sensitive skin of your child and lead to rashes. But research has shown that if you use cranberry juice, it will balance the pH level and thus neutralize the alkaline factor of the urine which in turn will reduce the skin irritation easily. In addition, it is also a great anti-inflammatory agent that will have a soothing effect on the irritated and the inflamed skin of your baby. Method of application: To get the benefits, you just have to feed your baby with the cranberry juice everyday once and get rid of the diaper rashes. Tea tree oil being a great antiseptic is widely used in treating several skin problems and for diaper rashes even, it is a good home remedy. It is one of the best essential oils owing to its antimicrobial properties that as per studies can soothe inflamed skin and fight several microbes easily. However, since tea tree oil is slightly acidic, so it is better to mix it with the skin friendly coconut oil to ensure better results. Method of application: Take around 1 tablespoon of coconut oil and mix it with 2-3 drops of tea tree oil. Now, take the solution in your fingertips and gently massage it on your baby’s infected skin. Use this remedy once regularly for faster benefits. Another essential oil that you can use as one of the home remedies to treat diaper rashes in babies is the frankincense oil. It is a great anti-inflammatory agent that can reduce the swelling of the skin and soothe the irritation. It is also a perfect antimicrobial agent that can help kill any bacteria or fungi that causes diaper rash in your baby. Here, also you can mix the coconut oil for better effects. Method of application: Take 2-3 drops of frankincense oil and mix it with 1 tablespoon of coconut oil. Now, massage the solution gently on the bottom of your baby. Continue doing this on a daily basis and enjoy fast improvements on your baby’s skin. You can easily use the grapefruit seed extract to treat the diaper rashes in your baby’s skin. This is because it possesses anti-inflammatory properties which will combat microbes and soothe the skin infection. To be more specific it is an antibacterial agent that protects your baby’s skin from the microbes. Method of application: Take around 10-11 drops of grapefruit seed extract and mix with half cup of water. Spray the solution on the infected skin of your baby. Use this remedy on a daily basis for the benefits. Diaper rashes make your baby’s skin highly irritated and inflamed so if you use a natural moisturizer like shea butter, things will improve very soon. Moreover, shea butter is also a great anti-inflammatory agent having analgesic properties which is highly beneficial in treating diaper rashes. It soothes the skin and relieves your baby of the pain. Method of application: Take organic shea butter and apply thinly on the infected skin of your baby. Make sure you have cleaned the skin thoroughly before applying shea butter. Use this remedy twice on a daily basis for effective improvements. Petroleum jelly is not a natural product but its absolutely safe and most of us keep it at home all the time, so you can definitely use it as one of the home remedies to treat diaper rashes in babies. As per the Indian Journal of Dermatology, petroleum jelly is one of the great moisturizers with excellent healing and anti-inflammatory properties that will soothe the diaper rashes in no time. Applying petroleum jelly is also a great way to restrict the entry of the various microbes which may have otherwise intensified the skin infection in your baby. Method of application: Properly clean the infected skin of your baby with lukewarm water and pat it dry. Then apply a thin layer of petroleum jelly on the infected skin and leave it to naturally dry. Apply the jelly twice on a regular basis for amazing results. How to prevent diaper rash in babies? Now, that you know about the best home remedies to treat diaper rashes in babies, I am sure you can try these remedies for it work magically. But what if you could completely prevent the occurrence of diaper rashes? Well that’s possible and here are a few essential tips on how to prevent diaper rash in babies. The very first thing that you should do is to change the diaper of your baby frequently and avoid using the wet and the used ones again. Every time you change the diaper, make sure you clean the skin of your baby before putting the new one. Make sure you do not tighten the diapers too much as it will cause uneasiness as well may intensify the rashes. Whenever you are washing your baby’s clothes, be very sure on the detergent you are using. Always use a mild skin friendly one for this. After you have cleaned your baby, never rub the skin too much. This is because an infant’s skin is very sensitive and the friction may lead to irritation. So, always gently pat it dry. Try to keep your baby dry most of the time. When you are out with your little one, there is no other option but to make your baby wear the diapers but when you are home, try to avoid it and let the skin of your baby breathe. Each time you touch on the rashes of your baby, try to wash your hands after that. This is an important habit that you should undertake to avoid the chances of the infection getting spread to the other body parts of your baby. And, not just you, make sure the others also follow it. Babies are just pure love. They are the innocent souls that needs to be protected against the harshness of the surrounding. Since, they are too little to protect themselves, you have to make sure they are safe all the time. Now, there can be several issues a parent face while taking care of the child, one such common problem being the diaper rashes. However, there is nothing to worry as there are easy solutions to that. I, in my today’s post, have discussed about the top 22 simplest yet most effective home remedies to treat diaper rashes in babies. You may use any of them to keep your little one rash free for long. Not just that, I have also mentioned certain additional points that you as a mother or a father must follow to ensure your baby’s safety. Remedies does not only involve applying certain medicines or natural products to treat the problem, sometimes little changes in baby care techniques also matter. Apart from treating diaper rashes, I have also discussed above on how to prevent the diaper rashes from occurring. All the home remedies to treat diaper rashes in babies are very effective and hopefully will work wonders on your baby’s skin. But if by any chance you find, it is not working in case of your baby, please do not hesitate to take doctor’s advice. Until then use the natural home remedies and do not let the diaper rashes take away the smile from your baby’s face. And, if you find my article valuable then please do like, comment, and share to earn good karma.